Toast pine nuts in a dry frying pan. Zest and juice the lemons. Mix a quarter of the lemon zest with some salt. Finely chop the garlic. Mix garlic, olive oil, vegetable broth, remaining lemon zest, and lemon juice in a bowl and season with salt, and pepper. Cook linguine according to package instruction and drain. Finely chop basil. Season scallops with pepper, then fry on each side for approx. 3 min. in a frying pan with some olive oil. Season with the lemon salt. Mix the hot pasta with the with lemon-oil mixture. 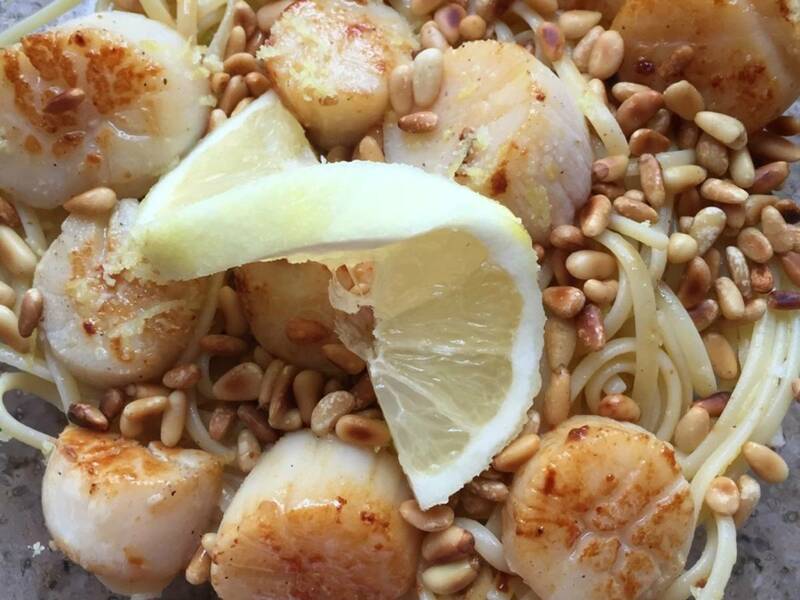 Serve with pine nuts, basil, and scallops. Enjoy!